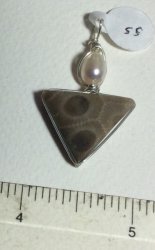 This is a nice pendant made from Petoskey stone with a pearl accent, wrapped in sterling silver wire. It is wrapped with sterling silver wire. Stone measures approx. 3/4� x 3/4".